Let's face it: 2016 has been a rough year in politics, and you definitely need something to get politically pumped about in 2017. And what better to look at than a list of exciting women in politics? These are the ladies who will be looking out for you when more anti-abortion regulations start appearing, when contraception becomes harder to obtain, and when you remember that the soon-to-be president has been accused of sexual assault by multiple women and even that didn't stop him from being elected. What I'm trying to say is that there's a lot to worry about, but there's a lot to be optimistic about as well. As of January 2017, there will be one more female U.S. senator than ever before, and there's evidence that women are more effective legislators than men — as if that was really a surprise to anyone. The country got closer than ever to a female president, and while that ended in a painful defeat, 56 percent of people believe that the country will see its first female president in the next decade. California's newly elected senator Kamala Harris is exactly the kind of fresh face that the Democrats are looking for to energize a flailing party. She'll be the second black woman in the Senate, and she's got her sights set on criminal justice reform. With years of experience as the California attorney general and a district attorney in her back pocket, she could be just what her party, and her country, needs. Nancy Pelosi's recent re-election as House minority leader came as a blow to those who were hoping for change within the upper echelons of the Democratic Party. However, remember that she's also been in power when the party was doing well. She's a person who knows how to lead, and right now, liberals need that. 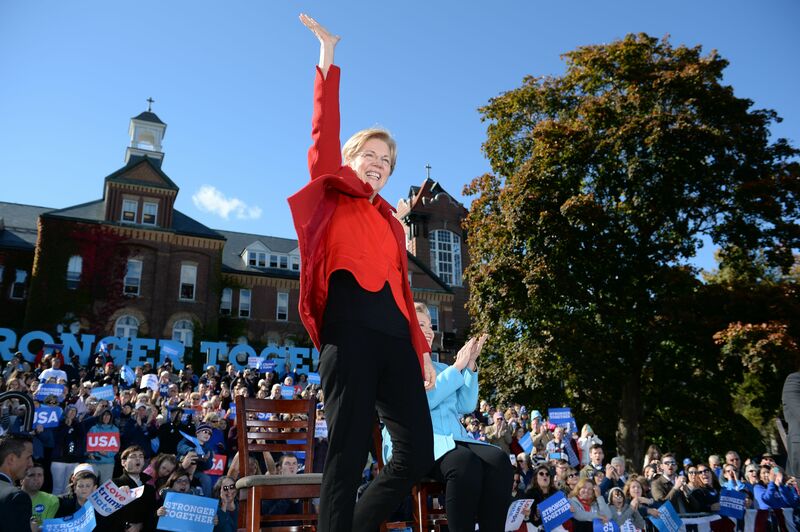 What more needs to be said about Massachusetts Sen. Elizabeth Warren? She's the liberal attack dog on everything from Donald Trump's conflicts of interest to abuses of the middle class, and she'll be more needed than ever with Republican control of Congress and the White House. OK, so technically Michelle Obama is leaving politics in 2017, but that doesn't mean that your hope has to leave with her. There are already Super PACs forming that will try to convince her to run, and whether or not she does, she'll likely be around to give rousing speeches and rally people to the causes she cares about for decades to come. Missouri Sen. Claire McCaskill has been a powerful voice in the center-left for several years now, and she's already begun speaking out about Trump's broken promises. There have even been calls for McCaskill to run for president one day, so she's one to follow closely. Ellen Malcom, the founder of EMILY's List, isn't technically a politician herself, but she's sure helped to get a lot of female politicians elected. She realized early on that women needed more financial support to get into office, and so she set out to rectify that problem by founding an organization meant to finance the campaigns of female Democratic candidates. Now, there will be 21 women in the Senate. Coincidence? Definitely not. You may not recognize Minnesota Sen. Amy Klobuchar's name yet, but it's one that you should remember. She was the most productive senator in the last Congress, as 27 bills that she authored ended up in President Obama's hands. This is clear proof that she knows how to get stuff done, and that's going to be a necessary still this time around. There are few bigger badasses than the three wonderful female Supreme Court Justices, Elena Kagan, Sonia Sotomayor, and Ruth Bader Ginsberg. Trump isn't likely to nominate a female justice to fill the empty seat, so have faith that you'll have these three ladies on your side, protecting all of your constitutional rights. OK, so on second thought, Tammy Duckworth is actually the biggest badass on this list. She's a newly elected senator, who will be moving to that side of the Capitol building after four years in the House. She's an Iraq War veteran and a double amputee, and she'll be only the second Asian-American senator. This is definitely a woman whose future I am very excited to watch. So, not everything's doom and gloom. The country will survive the next four years — and when it does, these women, and so many more, will be the ones that you can thank for it.